Shap is a long village situated in the Eden District of Cumbria. Although small it is actually a market town with a charter dating from the 17th century. The A6 and the West Coast Main Line run alongside the village and the M6 is also close by. Hanson and Tata Steel works is located just outside the village. Shap has three pubs and a variety of shops including a small supermarket, a fish and chip shop, a butcher’s, a newsagent’s and a coffee shop. 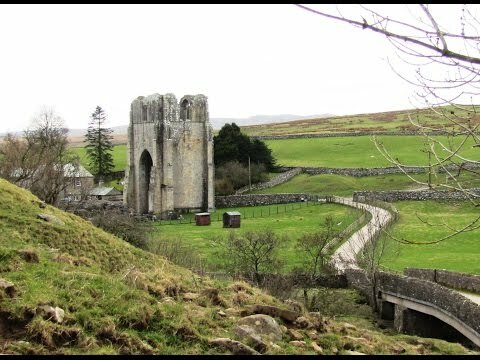 Shap is on the route of Alfred Wainwright’s Coast to Coast walk and close to Shap Abbey. The market town of Penrith that lies 10 miles north of Shap has a good variety of shops and facilities. Shap Abbey, situated on the western bank of the River Lowther, was a monastic religious house of the Premonstratensian order. Although the present abbey was built in 1199 the monastic community was originally founded on another site 20 miles south of Kendal in 1190, but it moved to the present site then called Hepp in 1199. The abbey prospered for around 300 years until the Dissolution of the Monasteries when the lead was taken from the roof and the building stones carted away for re-use elsewhere. During the 17th century masonry was robbed to build Shap Market Hall and much of the ornate carved stonework was taken to be used in the building of Lowther Castle. Many of the monastic buildings were incorporated into a farmhouse and used as barns and over the last four centuries little has changed as they have formed part of a working farm. All that remains today is the tower, still at its full height, and the outline of the buildings is clearly visible. It is in the care of English Heritage and managed on its behalf by the Lake District National Park. Shap Abbey is open to the public at all reasonable times and admission is free. The River Lowther begins with the confluence of the Keld Gill and the Keld Dub near to the village of Keld. It is a tributary of the River Eamont which in turn is a tributary of the River Eden which flows into the Solway Firth near Carlisle. Keld is a small, picturesque olde-worlde hamlet about a mile south-west of Shap. Like Rosgill it is situated the banks of the River Lowther. Keld, possibly a village in Roman times, is home to the rustic stone building known as the Chapel at Keld. The medieval chapel, dating from around the 15th century, has been used as a cottage and meeting house during its long history and originally was thought to have been the chantry for the monks of Shap Abbey. In 1918 the building was presented by Sir Samuel H Scott to the National Trust for places of Historic Interest. This wonderful corner of the Lake District is largely unaffected by tourism and life goes on much as it has done for centuries. From the bridge we take the footpath, signposted Coast to Coast, on the left through the gate. With the River Lowther on our left and the wall on our right we follow the track bearing right to go through a gate. We bear immediate left off the track following the arrow C to C Shap written on a stone. With the wall on our left we cross over a wall into a field then keep heading forwards. At the end of the field we turn left over a stone bridge. At the top of the steps we bear slightly right following some large stones to the farm we can see in the distance. We cross in front of the farm heading towards the next farm going over a stile in the wall. We head forward to the farm track and turn right. We walk between the farm buildings and follow the footpath sign on the wall through a gate. We turn immediate left to go through another gate and head forwards to the right of two trees. We go over the brow of the hill then head down to go over a stile. After a short way we come to a concrete track we turn right over the bridge then immediate left uphill through the trees with the wall on our right and the stream on our left. We keep following the path passing through a gate until we come to a farm. We go through the gate with a yellow arrow then make our way through the farm and turn left to follow the farm track which becomes a tarmac single road. We keep following the small road going straight over at a crossroads. We continue forward crossing over a bridge to the village of Keld. We walk through the village, ignoring the path off to the left for Shap Abbey, and just after passing the Chapel on our right we turn left at the footpath sign past Kiln House on our left. We head forward over the stile following the wall on our right. At the end of the wall we head forward to the left of the tree and follow the wall on our left for a short way to cross over the stone stepped stile then turn right. We keep following the wall now on our right to go through a gate. We keep heading forwards and soon see Shap Abbey on our left. We continue forward through the gate next to a stile then bear left downhill to the tarmac track. We turn left over the bridge to visit Shap Abbey. We then go back over the bridge and follow the road uphill. At the building on the left we turn left over the ladder stile. We continue forward through the field with the river on our left. We go through a gate and keep following the wall to go through another gate. We walk forward keeping the building on our left to go through the gate in front and keep heading forwards through the fields until we come to the road. At the road we turn left and make our way over the bridge back to our car park. This is an easy walk on good paths and tracks mostly grassy through fields. There is also some minor no- through road between Tailbert and Keld. Approx 5.15 miles allow 2½ plus extra time for visiting Shap Abbey using OS Explorer Map OL5 The English Lakes North Eastern area. Start point: At the bridge over the River Lowther, south west of Rosgill near Shap. Rosgill is north-west of Shap in the Eden District of Cumbria. From the A66 at Penrith take the M6 south. Leave the M6 at junction 39 and turn right for A6 Shap on the B6261. At the t-junction turn right onto A6 following the railway line to Shap. Just before the end of Shap turn left onto a minor road. Bear right at the y-junction and follow road for about 1½ miles then turn left. Follow road through Rosgill to the bridge over the River Lowther. Free road side parking only. Parking: At side of road near the bridge over the River Lowther. There is a car park at Shap and at Shap Abbey and also some road side parking at Keld. The school in Shap also offers parking out of school hours only. There are no public toilets on the walk the nearest ones are in the public car park at Shap. For refreshments there are three pubs and a variety of shops in Shap. There is also a shop and two pubs at Bampton and Bampton Grange and two more pubs at Askham.